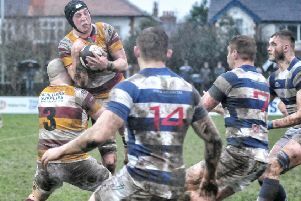 Fylde RFC returned to winning ways with a comprehensive four-try, 31-5 victory over Tynedale on Saturday. For large parts of the game, they dominated their visitors to produce a solid all-round team performance and fully deserved a bonus point victory. Fylde kicked off away from the clubhouse and immediately forced a lineout in the Tynedale 22. From this, they launched several phases of possession and looked like they were in for the opening score until a team-mate got in the way of Tom Grimes. Instead of a clear run in, the referee penalised Fylde for crossing and, with the heavens open, Greg Smith was forced to change his boots in only the third minute. It was Tynedale who opened the scoring when Harry Snowdon stole a Fylde lineout against the throw and set the platform for phased play. A neat chip through into the in-goal area followed and prolific winger Morgan Passman got to the ball first to give Tynedale the lead at 5-0 in the seventh minute. As the clock ticked towards the 20-minute mark Fylde were in need of a flash of inspiration to get them going. It came when a Tynedale ball carrier knocked on in midfield on half way. Quick as a flash, Connor Wilkinson swooped on the loose ball and fed Grimes, who drew the last man and put Tom Carleton in space wide out. The three defenders attempting to cover could only watch him barely hit third gear as he cantered half the length of the field and scored near the post. Smith converted and Fylde were in front at 7-5. This score seemed to settle Fylde down and, from this point on, they got into their groove and played a solid and sensible game suited to the way the opposition were playing, their own strengths and the conditions. Smith made it 10-5 with a 35-metre penalty on 26 minutes before they extended their lead shortly afterwards. The first of several fine takes by Matt Garrod set up a catch and drive which the forwards carried on for 20 metres. The ball was fed to Smith, and with Tynedale expecting him to release his dangerous backline, he instead took on the line himself, twisting and turning through the tackle to go over for a try which he converted for a 17-5 lead at half-time. The second half saw Lex Botha replace Henry Hadfield to make his home debut as Fylde began where they had left off. Having forced the first of a run of five consecutive home penalties in the first minute, they monopolised possession and made sure they played in the right areas. A Gus Warr kick led to a penalty which Fylde kicked to 20 metres out, setting up a catch and drive once more. The forwards did all the hard work, driving close to the line before Wilkinson got his hands on the ball to claim the try. Smith again knocked over the conversion and 24-5 already looked a winning lead with the way Fylde were playing. A Fylde knock-on 40 metres out was followed by a most amazing scrum as Fylde won it against the head and pushed Tynedale back 35 metres to just short of their own line. In desperation, Tynedale collapsed it and gave away a penalty; unsurprisingly Fylde chose to scrum again. After a further penalty for collapsing they were going over with the third scrum when a Tynedale player entered illegally and kicked the ball out. The referee rightly awarded the penalty try with Fylde’s celebrations and the ignominy of the last three scrums proving too much for one of the Tynedale props, who was sinbinned. With 62 minutes gone, Fylde had achieved the try bonus point and the win was in no doubt. Ben Gregory and Cal Ford replaced Alex Loney and Bevan Rodd, while Cameron Crampton and Chris Briers came on for Warr and Ralph Dowds respectively. Tynedale did not lie down and forced three of the remaining four penalties but without really threatening to trouble the scoreboard again. Fylde were now content that it was job done and were happy to peg Tynedale back in their 22 with Crampton using his boot wisely to do so before the referee called time and Fylde could be congratulated for a fine performance. Fylde: Carleton, Hadfield, Dowds, Wilkinson, Grimes, Smith, Warr, Connor, Dugdale, O’Ryan, Ashcroft, Garrod, Lewis, Loney, Rodd. Replacements: Ford, Gregory, Crampton, Briers, Botha. Tynedale: Beaumont, Passman, Checksfield, Miller, Pike, Hutton, Outson, Bell, Richards, Cousin, Snowdon, Dunn, Carmichael, Black, Elliott. Replacements: Batey, Hughes, Montgomery, Marshall, Nordli-Kelemeti.